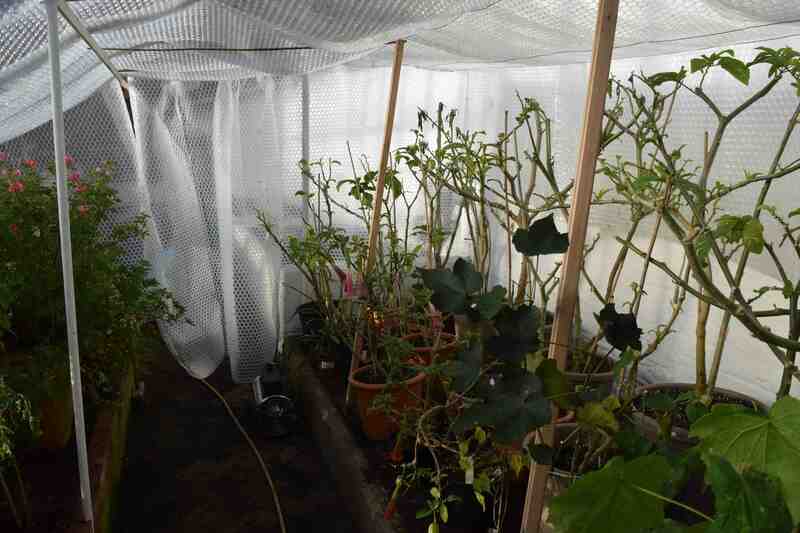 One of autumn’s essential tasks is making a cocoon in the greenhouse to help overwinter tender plants. I wish I could say that I liked the job more but it is always a dirty, unpleasant job unless you buy a new roll of bubble plastic every year. Of course there is always the joy of popping a few bubbles as you work but no matter where I store the sheets over summer birds always manage to ‘poo’ on them and the sheets never seem to be quite the right size the next year! So it is a fiddly job and although easy enough to affix with clips in an aluminium glasshouse or with staples in wood, and I use pegs to join the sheets where necessary, I always get a but frustrated doing it. So why do I bother? Well the main reason is that it reduces heating costs and, therefore, is a bit greener. But there are disadvantages too. Even if you use new, clean sheets it will reduce light levels a bit and, often, light is the limiting factor for plant growth in winter. This is not too much of a problem with the plants I have here but when I was growing winter-growing South African bulbs it was a factor and I used supplementary lighting. It also produces condensation which can encourage fungal diseases so a fan heater is essential and this year I have a fan heater that circulates the air continuously rather than just when the heat is on – much better than the last I had which only ‘blew’ when the heat was on and which is now in the garden shed to make tea break more tolerable! It is important that plants do not touch the plastic or moisture can accumulate and leaves and stems can die back. Because of this some of the brugmansias have been cut back to fit them in. I don’t like to do this until spring is on its way because the cut surfaces can die back but I can always cut back further in spring if that happens. But it is important that I retain as much of the upper framework of the plants as possible if I want early flowers this year. The bubble polythene will be taken down in late March or April, depending on weather conditions. Because it affects the ability to ventilate effectively temperatures can soar by then and it can be as harmful to the plants as winter cold.